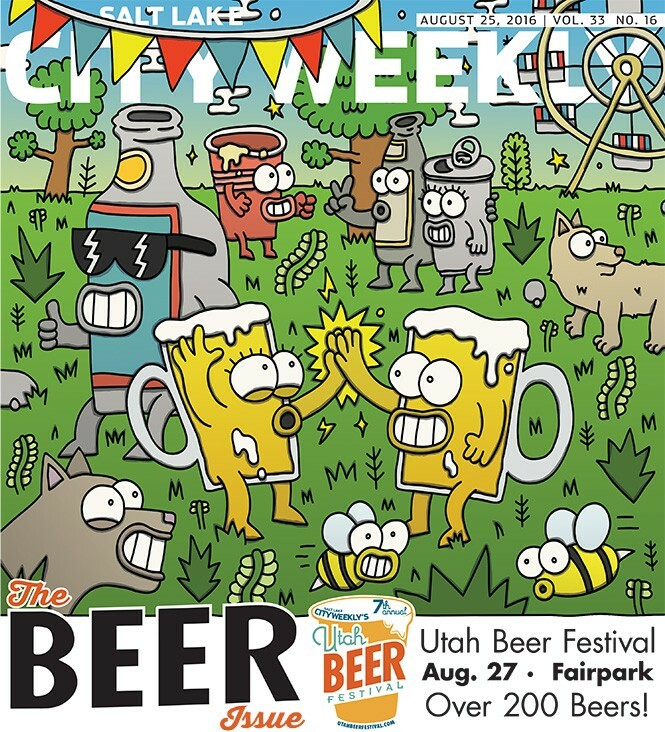 Cover Story, Aug. 25, "The Beer Issue"
Utah has some great beers. Now if you could just buy them at the bottle shop ... cold. My dog and I moved here a few weeks ago. When I picked up this issue, I knew we were in the right place. Facebook post, Aug. 26, "A beer label says a thousand words (even if they're a little slurred). Which one's your favorite?" Opinion, Aug. 25, "Russian Roulette"
WHOA. Appreciate the informed, community-minded work you are doing! I was disappointed when I read the opinion column [Aug. 25, "Russian Roulette"] in your most recent edition of City Weekly. While I have nothing at all against earthquake awareness, and even commend you bringing up the issue, I have a problem with the manner in which it was discussed. Your main argument in favor of earthquake preparation is based on a ridiculous statement: "According to many emergency management professionals, there is a 1-4 chance of our experiencing a killer earthquake disaster along the Wasatch, perhaps during the next 35 years." Please don't use fear tactics to try to make your point. If you're going to include those points, please clarify them. What emergency management professionals? The ones selling earthquake insurance? What science is it based on? The geologic record, which shows that there have been earthquakes roughly every 350-400 years, therefore another one should be coming anytime? That's not how science, or geology, or earthquakes work. Where do the 1-4 odds come from? Real math, or from Billy at State Farm's head? Where does the 35 years come from? And what does the perhaps mean, perhaps yes, perhaps no? I understand that the 1-4 odds allowed you to tie the earthquake issue to current events, and made for a nice piece, but please stick to reality. You still could have had a nice piece without trumping up (Ha! I can do it, too!) the facts to make an already valid point stronger. Instead, you turned me, and likely other thoughtful readers, off. If some of you are offended by the aggressive nature of my column, I apologize. If some of you go on to make your homes and lives safer, I am thrilled. Federal Emergency Management Agency (FEMA), the state of Utah and most counties and municipalities spend millions each year to prepare, practice and be proficient in earthquake response. In Utah, where legislators won't waste money on spit, they invest millions of dollars for something that professionals believe will happen. The easiest way to explain is to refer to a summary of the smartest geologist and structural engineers who believe that the earthquake is coming and has a 1-4 chance of happening in our lifetime. I summarized this professional thinking in the statement made in the latest Envision Utah preparedness resilience pamphlet: "We have 165,000 unreinforced masonry buildings, which will suffer significant damage, killing approximately 7,700 adults and children in roof and wall collapses." I am sorry if you took this as sensational, or if it scared you. That was not the intention. Like so many that I have trained with in preparation and response, I am fearful that many people who can be saved might not be because we don't take this basic preparation step. You may choose not to. And you may choose not to wear seatbelts. That is your choice. For most of us, doing things that can minimize future risk is worth the shot. I don't care if you have earthquake insurance, or need FEMA assistance or have to move into Aunt Martha's basement after the quake. I do care that your kid doesn't die in his or her playpen because your roof caves in. Drink, Aug. 25, "Beer Debunked"
Homebrewing is a great hobby. Where in the State of Utah can you have an award-winning 7-percent beer for $1 a 12-ounce bottle? Or $2 for a 22-ounce bomber? After brewing 70-plus batches on my brew system, the equipment has paid for itself many times over. You can brew styles you could never get on the warm shelf at the liquor store. The folks at the Beer Nut and Salt City Brew Supply could not be any nicer or more helpful. Give it a try, you won't regret homebrewing. Dine, Aug. 25, "Bohemian Rhapsody"
Stop telling people what a great place this is. It's tough enough to get a seat now—much less if others start invading my favorite brewpub. Soap Box, Aug 25, "From a proud Trump supporter"
Good for Aaron Heineman! Brave man. I, too, am a huge supporter, and echo exactly what you said. Why would anyone want more Kate Steinle murders? Why is this ignored? Why is it OK for my four grandparents to go through legal immigration, but it's OK to let people in illegally? What hypocrisy from the bleeding hearts. I pray to God we get some sanity back into this country. We are circling the drain. I don't care what color or nationality you are—just come here legally. Try getting into Mexico and see what they expect of you to be a citizen! Wake up, folks. "PR Power" [News, Sept. 1, City Weekly] incorrectly spelled 3rd District Court Judge Su J. Chon's name.